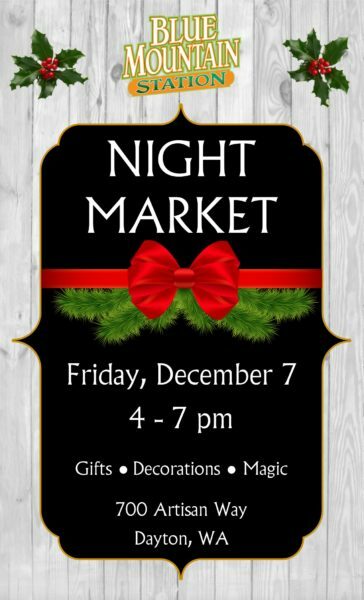 Get in the holiday spirit at the Night Market! Browse under the sparkling Christmas lights to find homemade gifts, delicious treats, and Christmas trees and decorations. Stop by a fire to warm your hands, and explore the Christmas Village with your kiddos. XO Alambic will be releasing their new Scythe & Sheaf Ancient Grains whisky! The new Ancient Grains is an eight-year, five-grain whisky crafted from rye, maize, emmer, spelt and sprouted barley. Mama Monacelli’s will be selling their artisanal candy, the perfect holiday treat, at 10% off all products. The BMS Co-op will have live Christmas trees and decorations for sale. In addition, a variety of local vendors will be showcasing their gifts. This one stop shopping experience will launch you easily in to the holiday season. And keep an eye out – you may even see an appearance from Santa himself!